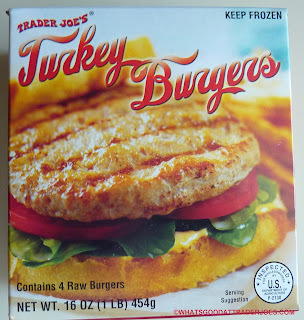 I've always liked turkey burgers. At their best, they're flavorful substitutes for traditional beef burgers, but with fewer calories and a little less fat. I like red meat from time to time, too, but I don't feel the need for it every day. All things being equal, I'll usually choose a turkey burger if that option is available to me. Trader Joe's offering is great in the texture department. It's not that they're an especially good approximation of beef burgers. But they maintain their moisture and juiciness even after cooking or grilling. They come frozen, and they look like little pale hockey pucks before heating. Speaking of hockey...D'OH! If anything, they're a little on the bland side, flavor-wise. Lacking any fancy combo of spices, TJ's kept things simple as far as added flair: just a little kosher salt and rosemary extract up in the mix. So you might want to dress these up a bit. I found them to taste better when cooked on our charcoal grill. Some good quality bread, cheddar cheese, Miracle Whip, mustard, and pepper really helped give them some gusto, too. I think these were $3.49 for four raw burgers. So they're cheap, convenient, and juicy—we just weren't dazzled by the flavor, although I wouldn't say it's anything to complain about either. We'll go with double 3.5's on this one. Did you thaw them before cooking, or cook from frozen? Cooked from frozen, per instructions on box. I like these, but nothing compares to the chicken chili lime ones.. those are tasty.... I like the size of the turkey burgers--tj's seems to skimp on size w/some of their other burger flavors. Haha yeah I've always liked Miracle Whip over mayo... but Sonia and I agree with you about the chili lime chicken burgers. I think you're the only other person on the planet who's not in love with them. They are popular (according to comments/reviews I've read), but just don't do it for me. A great TJ recipe base is to chop up a couple of turkey burgers, add some soy chorizo, salsa (hatch green chili is good!) and some pintos or black beans for a great chili! Add other stuff like chopped onions, etc. as desired, and serve with shredded cheese. The turkey burger adds body to the chili and mixes in well. A dusting of the ghost chilis heats it up nicely. Random TJ concoction. I do it all the time. For example, tou can make KILLER nachos with your fave TJ chips, soy chorizo, canned refried beans, sliced jalapenos, shredded mex cheese--bake for 15-20 min at 350, sour cream and salsa(s) on the side... All TJ's, all yummy! ...and guac, LOTS of guac! My 12 year old son and I love these. As always I sprinkle a little adobo on both sides, cook from frozen in a pan with some canola spray (about 6 minutes on each side) and they are juicy and delish. They are $2.99 here in NYC, BARGAIN! I always have to have these in the freezer for quick meals. I really like these! I top mine with the sweet hot jalapeños from TJs and melted cheddar. Eat with avo and garden tomatoes. No bun. I nook these for 2 minutes and eat them plain.